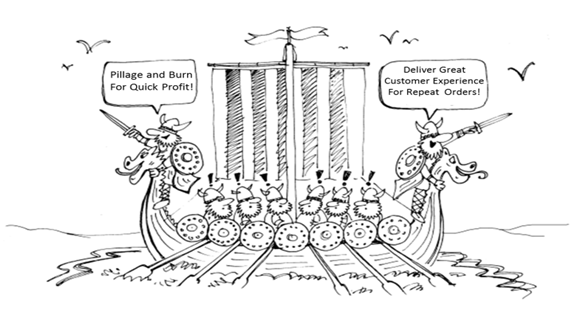 The Vikings of old were famous for using early maps on their voyage but Pillage and Burn may not have been the best strategy for gaining a high reputation for customer service and their repeat visits were not viewed with any enthusiasm! However the Vikings of today, Vikings River Cruises that is, also use maps – customer journey maps -in their modern voyages in search of wealth. They also have a clear vision of their aims expressed via a noticeably strong culture that creates no confusion about how they intend to achieve their objective and has the entire crew pulling towards the same destination, the rich lands of customer delight. On my latest venture a couple of key instances served to illustrate the point about the detail in their maps. 1. The dates of the cruise happened to include the USA version of Mother’s Day. At dinner every lady was presented with a red rose. A kind thought but here’s another one. Someone had considered the next touch point. What would the lady do with her rose when she returned to her state room (cabin). Leave it on the dressing table to watch it shrivel and die? Put it in a tooth glass? Bin it? None of these, on returning the lady found an elegant rose glass ready and waiting to be used so that the rose could be enjoyed for the rest of the voyage. 2. At lunch one day, where the service was always delivered almost at the speed of light, my wife had ordered a drink which had not arrived at the usual speed but still not long enough to outside the range of very good service. My wife jokingly asked the waiter if they were a bit short staffed today as her drink arrived. Almost immediately the maître di and the ship’s manager were at the table apologising for the service. Even a remark in jest was checked to ensure the customer was happy. 3. My wife and I were the only people on the vessel (192 in total) from the UK. Each morning we received a “Viking Newspaper – UK version”, all other passengers were from the USA and it would have been so easy to have given us the USA version and perhaps we may not have noticed, but again detailed experience management. All of the expected five star facilities were there and processes designed to make the experience beyond good, like four breakfast servings starting a 0530 hours to meet the varying wake up needs of the customers. A passenger to crew ratio of 1-4 helps but without the right mapping and motivation that could be just an ineffective fixed cost. So is their investment in mapping and delivering the journey worthwhile? After our second river voyage in two years we are looking forward to the third. Would we try another supplier? Not worth the risk of disappointment!